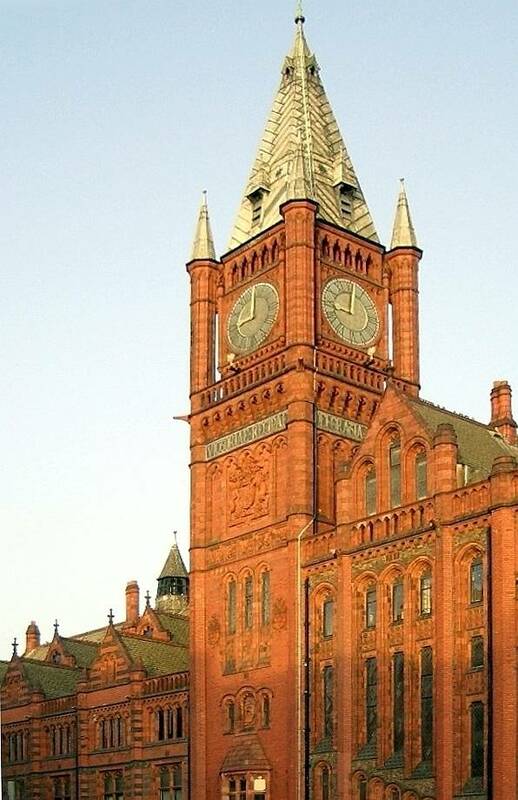 Victoria Building, University of Liverpool By Alfred Waterhouse (1830-1905). Opened in 1892 — the building that gave rise to the description of provincial universities as "red brick." Located on Brownlow Hill, at the corner with Ashton Street. 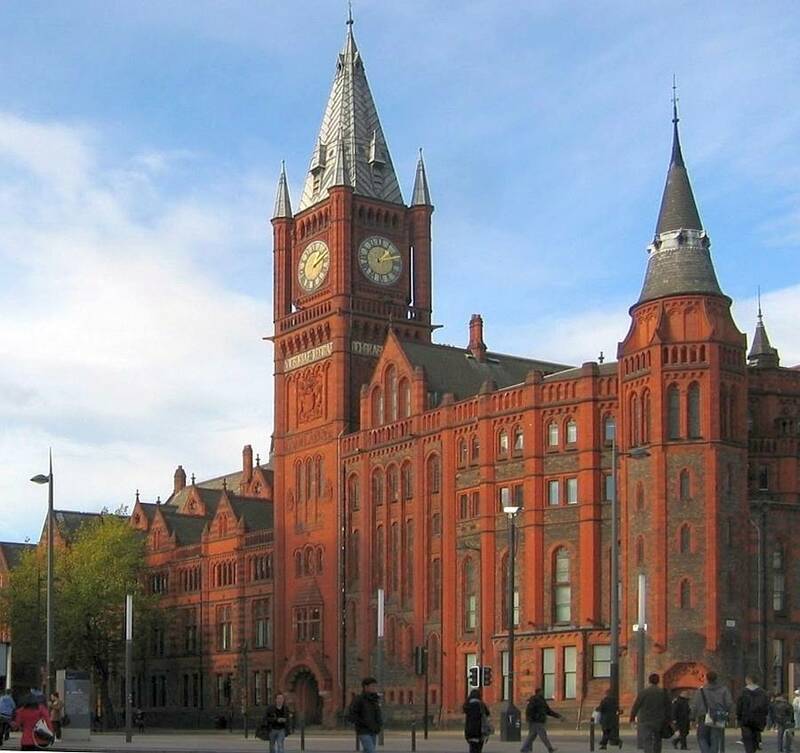 Here, Waterhouse designed the "Hall, library, and lecture rooms with Jubilee Tower, all of brick and with red terracotta dressings with slate roofs and faience decoration to the interior" (Cunningham and Waterhouse 263). It was the principal college building, providing rooms for all administrative and teaching purposes, with the library at the top. "Stridently red and assertively Gothic," it flaunts its "fiery Ruabon brick" as brightly as ever now (Pollard and Pevsner 363), its colour hardly toned down by the areas of ordinary brickwork. Left: The Jubilee Clocktower, a Liverpool landmark. David Lewis describes it as "more suited to a Prague church than to a British University" (53), perhaps thinking of the Old Town Square in Prague with its tall clocktower. But the spirit behind it is uniquely British. The inscription above the royal coat of arms reads: "Victoriae Reginae Dei Gratia L Annos Feliciter Regnanti Cives Posuerunt," or (translated from the Latin) "For Victoria, Queen by the grace of God, in commemoration of 50 years of fortunate reign; erected by the citizens" ("Facts/Quotes"). 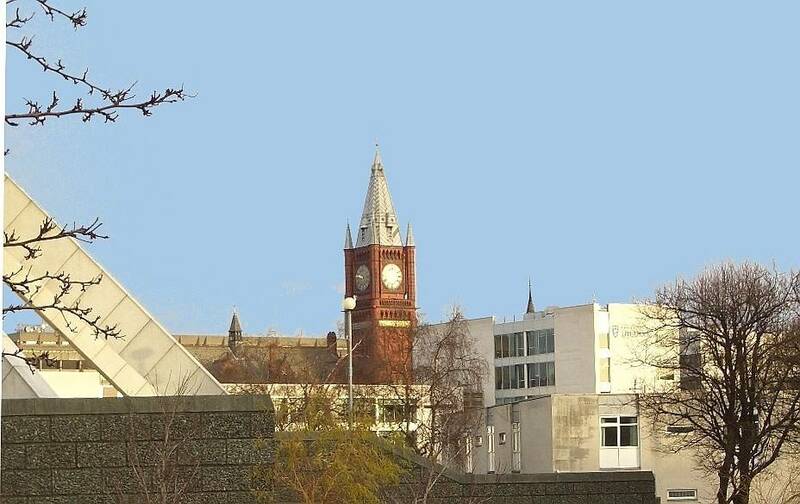 Right: Victoria Building from Ashton Street. On the shorter side of its L-shape, which has only five bays to the thirteen on Brownlow Hill, the building adjoins the contrasting neo-classical Ashton Building of 1912-14. Underneath this dramatic exteriuor are practical and fireproof construction materials of iron and concrete, with the Jubilee Clocktower "apparently" strengthened by steel (Pollard and Pevsner 363). But one of the pleasures of the building is that in another way the exterior shows rather than hides the interior: for example, staircases are expressed externally by the windows aslant the gabled bay to the right of the clocktower, and also in the last bay on Ashton Street, making an attractive feature on both elevations. Victoria Building is now used as a gallery and museum. View from outside Liverpool Metropolitan (Roman Catholic) Cathedral on Mount Pleasant. The tower rises above the more recent white tile-clad blocks of campus buildings. The left foreground gives a glimpse of two of the slanting concrete supports buttressing the famously space-ship like cathedral. Again, the contrasts are striking. Cunningham, Colin, and Prudence Waterhouse. Alfred Waterhouse, 1830-1905: Biography of a Practice. Oxford: Clarendon, 1993. Print. "Facts/Quotes." 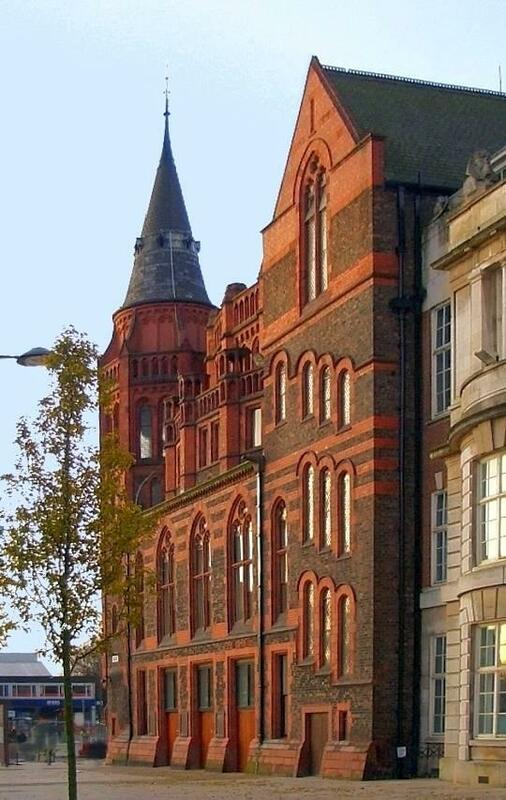 Victoria Gallery and Museum (Liverpool University site). Web. 4 March 2012. Lewis, David. Walks through History: Liverpool. Derby: Breedon, 2004. Print. Pollard, Richard, and Nikolaus Pevsner. Buildings of England: Lancashire: Liverpool and the Southwest. New Haven: Yale University Press, 2006. Print.